Lasing, S.A. since 1980, is dedicated to the distribution of the most advanced technology in instrumentation and photonic products in Spain. Lasing is a recognized leader because its high professionalism and excellent technical support. This is evidenced by a large number of installations in Test Laboratories in Universities and Medical Centers and also in Industry. JPK’s new OT-AFM Combi-System pairs the exceptional surface force measurement and imaging capabilities of atomic force microscopy with the ability of optical tweezers to apply and measure smallest forces in 3D. We will introduce the new system from both a technical and applications point of view. Combinations with advanced optical techniques and examples of applications from the fields of single molecule dynamics, cell mechanics and immunology will be discussed. Lasing exhibitor in NanoSpain Conference. Come and meet us at our booth. 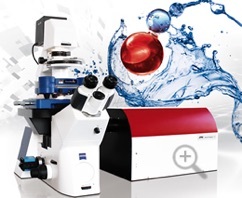 The OT-AFM Combi-System pairs the exceptional surface force measurement and imaging capabilities of AFM with the ability of optical tweezers to apply and measure smallest forces in 3D. The unique combination of 3D positioning, detection, and manipulation provided by OT and the high-resolution imaging and surface property characterization of AFM opens up a whole new spectrum of applications. Laser projectors are optical guidance systems. They enable working without templates in many manufacturing processes by showing directly on the workpiece how material needs to be positioned or mounted. Like that, the employee is led by manual or semiautomatic productional processes visually.